No End in Sight: Iraq and the U.S.
No End in Sight examines how Iraqis' lives have changed since the U.S. occupation of Iraq. Photo courtesy of Magnolia Pictures. In the documentary No End in Sight, we see a lot of familiar images and hear a lot of familiar speeches. Filmmaker Charles Ferguson shows us recent newsreel footage from Iraq since the U.S. invasion of Baghdad in 2003. Further, he refreshes our memories of the public statements broadcast from the White House that informed Americans about the progress of our troops there. 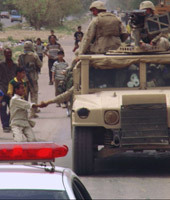 But at the same time, Ferguson looks into the content of reports sent from the frontlines as U.S. officials struggled to secure Baghdad and bring order from chaos. We cannot help but be startled and alarmed by the contrast between the content of those field reports and the assessments delivered by the White House to the American public during that same time. Ferguson explores the question of how troubling reports and anxious appeals for resources and assistance were transformed into public declarations of confidence and progress. It might be tempting to brush aside No End in Sight as another sensationalistic work of political bias and propaganda. But no, Ferguson does not give the microphone to the administration’s notorious political opponents. Instead, he consults the very experts that the U.S. government selected and sent into the Baghdad fray to establish order and democracy. These individuals who willingly participated in the strategies of the current administration now testify that things did not play out properly, and that they did not receive the resources or support that they needed. As they speak, they are angry, heartbroken, and deeply embarrassed by the errors in judgment and irresponsibility of Americans on the international stage. Meanwhile, violence in Iraq spreads like a disease, while insurgencies complicate the war efforts. Iraqi civilians talk about how a life that was violent and painful under the rule of Saddam Hussein is much more difficult now, as rivalries between different Middle Eastern sects clash and battle for supremacy. If there is a lesson to be learned from No End in Sight, it is this: The view from the street is very different than the view from the tower. And it’s probably best not to seek to take action on the street until you have learned what it’s like and prepared accordingly. New films help moviegoers learn to love and understand their global neighbors. Reviews of new books Our Day to End Poverty and Who Really Cares.